I was asked to start a blog after I made comments in other blogs. Besides my ideas, I encourage you to make comments and ask me to comment on topics. This afternoon I had the TV on the channel for the Super Bowl football game. The official title for the game was "Super Bowl XLI". "XLI" - - That means: 41. I got to wondering about roman numerals so I went to my computer and brought up the Wikipedia article for Roman Numerals. Wow, what an interesting article. Not only does the article indicate how the character symbols are supposed to be used but it mentions how the symbols have changed their usage through the centuries. Near the end of the article is a link to an article titled "Roman arithmetic". That, too, I found interesting since I've always wondered how you could do math using roman numerals. What is the roman numeral for the number 4? Most commonly it is IV. But in times past IIII was also used. Even today it is very common for clocks using roman numerals to use IIII for the four o'clock hour instead if IV. Why? The above article offers some interesting explanations. My oldest son, John, recently had a thrilling experience. 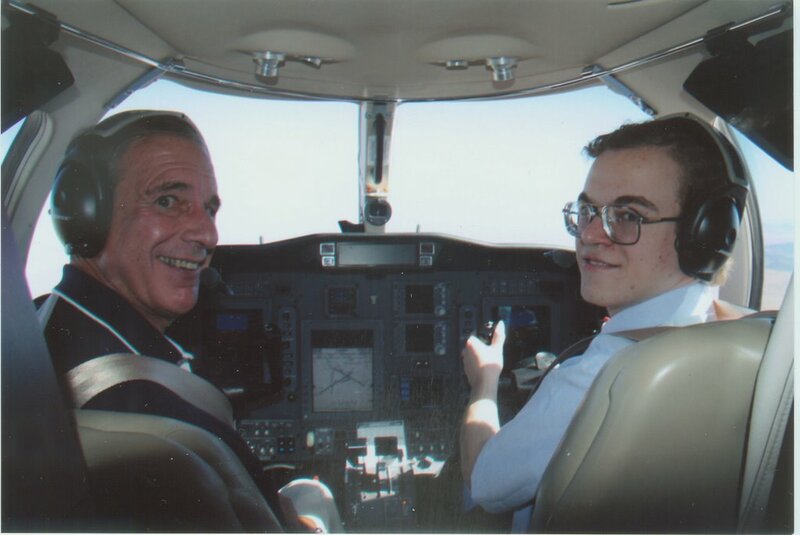 He got to fly in the co-pilot's seat on a jet aircraft, a Cessna Citation CJ3. The flight was a reward for special work he had done at his college, Embry-Riddle Aeronautical University in Prescott, Arizona. John flew in the co-pilot's seat, the front right seat. In the pilot seat (left front seat) was Phil Boyer, the president of the Aircraft Owners and Pilots Association (AOPA). John got to pilot the jet aircraft enroute from the Prescott airport to the Winslow, Arizona, airport. Then John got to land the jet airplane himself at Winslow. John is now in his fourth year of college at Embry-Riddle in the professional pilot program. Next May he will graduate with a Bachelor of Science degree in Aeronautical Science. I also have a private pilot's license and I thoroughly enjoy flying airplanes. I don't fly very often because it is quite expensive. Fortunately, John has had wonderful opportunities in aviation. 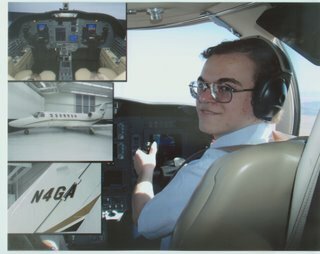 He attended a high school with an aviation focus and got his private pilot license (paid for by the school system) a few weeks before he got his high school diploma. He also got to attend two summer camps at Embry-Riddle before applying for admission. I also belong to an organization named the National Association of Priest Pilots (NAPP). We have priest members who do all kinds of things in aviation. There are priests in Africa flying planes to support medical missions, priests in New Mexico who fly medical supplies into Mexico, priests who are certified flight instuctors (and train some of those medical missionaries), we even have priests who are commercial airline transport pilots, and priests in Alaska who weekly fly to small towns for church services. I am really proud of my son John (and somewhat jealous!). Today I came accross a list of the top ten most misspelled city names (apparently only U.S. cities are on this list). Of course, my city is on the list. So then I looked for lists of regular (American) English language words that are commonly misspelled. I found a lot of such lists. Here are two lists. Other common misspellings that I run across as I read blogs are really errors where people don't know the proper usage of certain words. A friend of mine who works at a daycare center e-mailed me with an interesting account of something that happened there yesterday. I told her that I would post it on my blog for the "whole world" to read as a public service announcement. Today at work, a woman came and picked up her sixteen-month-old, carried the child (holding her car keys) to the car, strapped her into her carseat, and, hoping to avoid a tantrum until the last possible second, let the child continue holding the car keys while she got herself into the car, intending to reach back and retrieve them after sitting down and buckling her own seatbelt. In the split second between the mother shutting the back door and opening the front door, the child pushed the "lock" button on the remote. The heat index here today was something like 110 deg F. (43 deg. C.). The mother at first tried to get the child to unlock the door, but the little girl laughed and threw the keys onto the floor. The mom ran back to the building, and we called 911. It took five minutes for the police to respond, and then they said that due to some kind of civil-liberties b.s. from our buddy Dubya, they were not allowed to have "Slim Jims" anymore. They didn't want to break the window except as a last resort, because they were afraid of injuring the baby with flying glass. They wanted to wait for the fire department to arrive; apparently the fire department still has "Slim Jims." It took another five minutes for the fire department to get there. They tried the "Slim Jim." No luck. They tried a very long, fluorescent plastic thingy, which didn't work either. The director of the center ran inside to look for a hammer, because we were all starting to think about those ads that say how your dog can die in a hot car in something like fifteen minutes, even WITH the window cracked (the windows of the car in question were fully closed; fortunately the woman had parked in the shade, but it was still f#@*%+# HOT). I have a rescue hammer in my minivan, and mentioned that, and we were just on our way to get it when, after nearly ten minutes of trying, the fire department guys were able to pop the lock on one of the doors and get the baby (who was sweating profusely and not all that happy, but fully alert and apparently none the worse for wear) out of the vehicle. Fortunately, our staff R.N. and L.P.N., and a parent who is a doctor were all standing by; they took the child inside and put ice packs under her armpits, and gave her a bottle of Pedialyte. Everybody neglected the front desk and swarmed into the nursing center sniffling and cursing the useless police and our idiot president, and assuring the distraught mother that we had all, countless times, done pretty much the same thing. Never again. My kids aren't touching my car keys until they are old enough to drive. Maybe not even then. And don't you let yours, either. Bold the ones you've done..
Mary P. started this meme. Wow, there is a story behind every one of those, even the ones not in BOLD. If you ask I will tell the story(ies). the bushes a few times, we learned to solve the problem. rooms..........WE HAD FRIENDS and we went outside and found them! dirt, and the worms did not live in us forever. put out very many eyes. rang the bell, or just yelled for them! didn't had to learn to deal with disappointment. Imagine that!! TO DEAL WITH IT ALL! A week of visiting and traveling has come to an end. Before this past school year began, my ex-wife moved across the country to Virginia. She took my youngest son, Jason, with her. 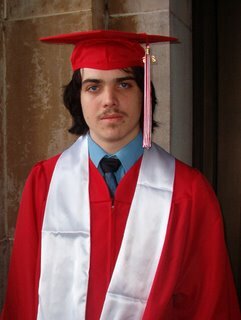 This was his last year of high school (12th grade). 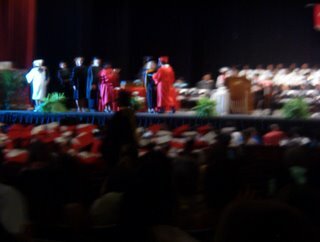 On Wednesday, June 7th, Jason's high school had their graduation ceremony (in Richmond, Virginia, USA). I was really glad to be there. His mother and I cheered him from the crowd. Jason turned 18 years old two months ago. 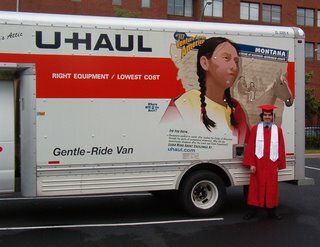 Being legally an adult, he decided that after graduation he wanted to move back to my house in Arizona. He has acquired too much stuff to just hop on an airplane, so we rented a U-Haul truck and spent all day Thursday loading up his furniture, TV, computers, and many boxes of other stuff. 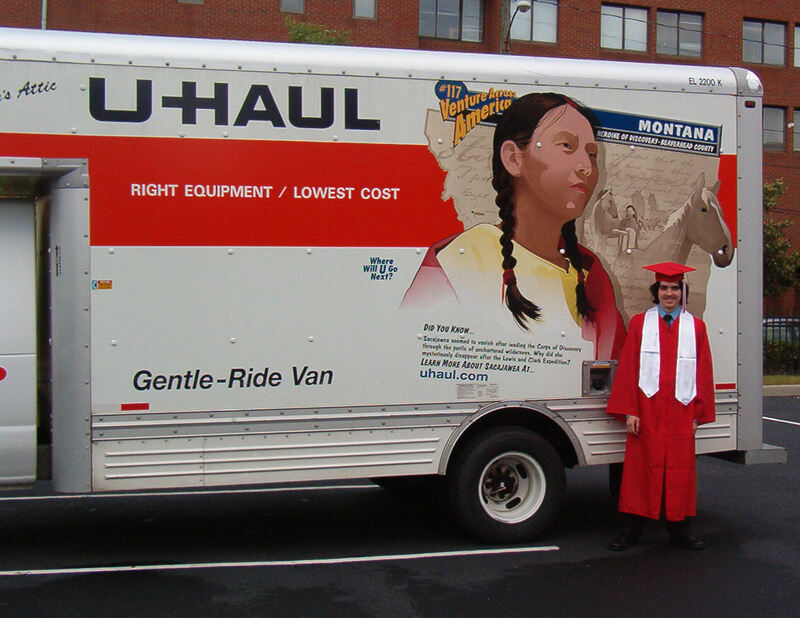 On Friday, June 9th, we climbed into the U-Haul truck and headed out. On Saturday, June 10th, my cell phone rang and it indicated that the call was coming from my home in Phoenix. Had my other son visited my house? No, it was a Phoenix Police officer. He said that my neighbor had found my house's front door kicked in and the door was open. The police officer said that they had searched the house and no one was there. He said that the place looked a bit ransacked. I told him that was really my fault since the house was really a mess when I left. I asked him if any police officers were injured climbing over all of the messy stuff that I had everywhere. He laughed and said, "No." I called my oldest son, John, in Prescott, Arizona, where he is going to college and where he is staying for the summer sessions. John immediately headed for Phoenix (about two hours away). When John got to the house he reported that he did not see anything stolen - - TV's, stereo, and several computers were all in place. I called my insurance company and they sent a contractor over to patch up the front door. After that, John loaded the more important computers into his car and went back to Prescott. Since we were then anxious to get home and see the "mess" at my house, Jason and I drove longer days in order to get home sooner. We did not really have much of a travel plan but since I rarely travel across the country I had hoped to be able to make several stops along the way. Instead we concentrated on distance each day. The big project for today is to unload the U-Haul truck. Next project: clean up the house!!!!! (#1) Well, here we go. Starting a new blog. Regarding the Roman Catholic Church, the opinions expressed here are consistent with canon 212 § 3.